March 15, 2019 – Local 2785 Hiring Hall will be open to new “Class A” registrants for thirty (30) days. 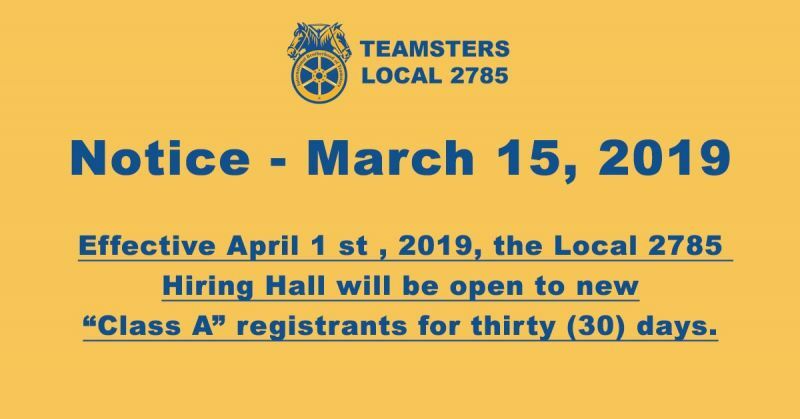 Effective April 1st , 2019, the Local 2785 Hiring Hall will be open to new “Class A” registrants for thirty (30) days. The Hiring Hall has a maximum of thirty (30) openings to fill. A “Class A” license with no restrictions is required to apply. A copy of your Driver License must be submitted as proof along with the pre-application. Offers of registration are subject to the applicant’s submission of current DOT drug screen. Only completed pre-applications with a Class A license with no restrictions will be accepted and reviewed.